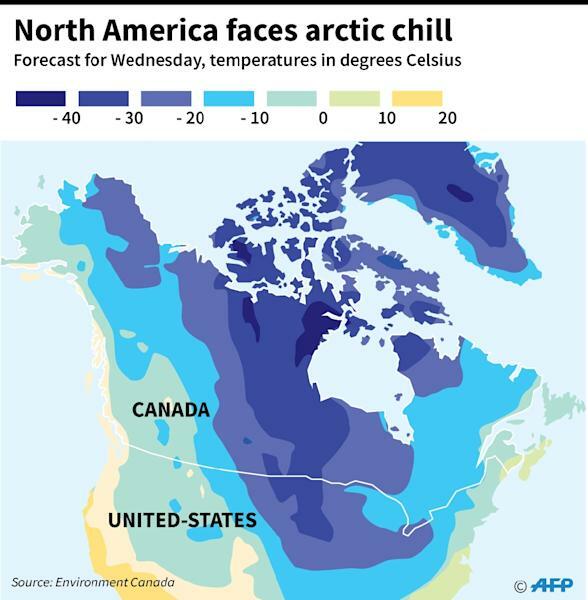 Chicago (AFP) – Tens of millions of people in the United States are bracing for a potentially life-threatening deep arctic chill forecast to hit swaths of the country on Wednesday. The US Postal Service — known for its commitment to bringing the mail whatever the weather — has even reportedly suspended deliveries in Iowa due to the severe cold. „One of the coldest arctic air mass intrusions in recent memory is surging south into the Upper Midwest before spreading across much of the eastern two-thirds of the country,” the National Weather Service said. Chicago, America’s third largest city, was expected to be colder than parts of Antarctica. „We need everyone to do your part and make sure you and your families are prepared,” said Illinois Governor JB Pritzker. 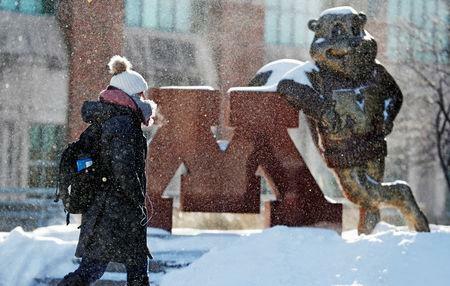 „People exposed to extreme cold are susceptible to frostbite in a matter of minutes,” warned the NWS. „They are life-threatening conditions and temperatures,” Chicago Mayor Rahm Emanuel told a news conference. In Canada, the icy temperatures — stretching from Manitoba in the western Prairies region to the Atlantic seaboard — prompted a rare „hazardous” cold warning from the government. An additional 200 flights were canceled at Toronto’s airport. But the National Oceanic and Atmospheric Administration, which operates NWS, tweeted, „Winter storms don’t prove that global warming isn’t happening,” with a link to a 2015 explanatory article. CHICAGO – As the Midwest girds for days of subzero temperatures, government agencies and social service nonprofits are scrambling to get some of their most vulnerable charges out of the cold. Officials in Chicago have added 500 shelter beds for the homeless and tapped more than 100 religious leaders to make calls and checks on senior citizens. Officials in Detroit report a surge of demand at shelters. And ambulance crews in Minneapolis plan to treat all outside calls as potentially life-threatening. Chicago Mayor Rahm Emanuel said his administration will dispatch five Chicago Transit Authority buses to the streets Wednesday to give homeless people who might be resistant to going to a shelter a place to warm up. City workers will canvass the streets for people to assist. Emanuel asked residents to check in on vulnerable neighbors. “Everyone of us has a role to check on somebody who is maybe a neighbor on the block who is elderly, infirm or needs extra help,” he said. Chicago has an unhappy history of weather crises wreaking disproportionate harm on some of its most vulnerable populations – and causing headaches for politicians. A storm over New Year’s weekend in 1999 that dumped more than 21 inches of snow and shut down the iconic Lake Shore Drive for the first time in history was a factor in 43 deaths, including heart attacks while shoveling snow and exposure to cold. A massive blizzard in January 1979 that left at least seven dead is blamed for the election defeat of Mayor Michael Bilandic a few months later. The city was gridlocked for days; voters blamed Bilandic for being too slow to dig out the city. In the midst of a heat wave in 1995, the Chicago area recorded more than 700 deaths from heat-related illness in a five-day period. Those who died were disproportionately elderly, poor and African-American. As the mercury tumbled in Chicago Tuesday, Emanuel urged residents to be smart and act with caution. Officials and nonprofits throughout the Midwest are taking similar actions. 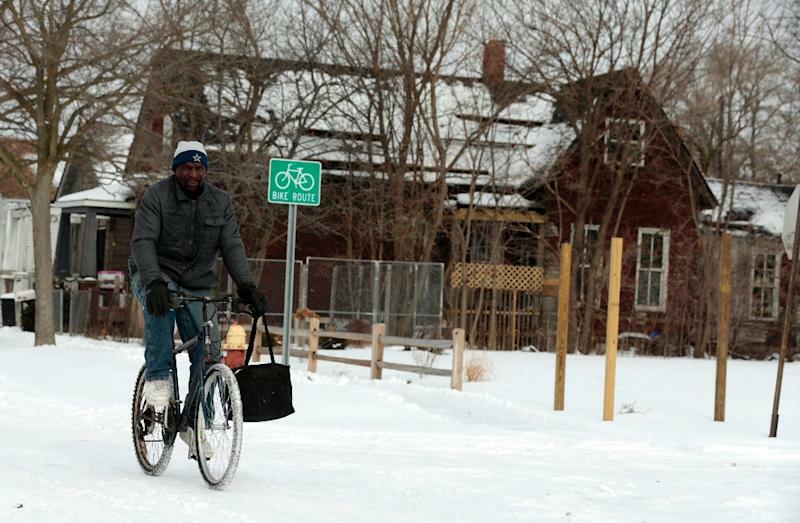 A snowstorm and life-threatening temperature warnings this week have already taxed Detroit shelters, filled soup kitchens and strained nonprofits that help the homeless. On the eve of the Polar Vortex, Detroit Rescue Mission Ministries Facilities Supervisor Herbert Morris talks with Curtis Farr-El, 58, about seeking shelter at his makeshift home under a viaduct on Interstate 75 in Detroit on Tuesday, Jan. 29, 2019. Some areas of Lower Michigan could face wind chills as low as 45 degrees below zero, according to the National Weather Service. In Sioux Falls, South Dakota, homeless shelters are bracing for increased demand. The Bishop Dudley House has room for 80 men and 20 women, as well as seven family rooms – and already this winter, they’ve had a few nights where they’ve exceeded capacity. Wind chills in Sioux Falls could reach the minus-50s on Wednesday. Development coordinator Amanda Stidd said they won’t turn anyone away. „We will find a spot for people to come in,” she said, whether that’s lining cots and mats up where they can, putting people in day rooms or using hospital beds in the shelter’s medical respite rooms. 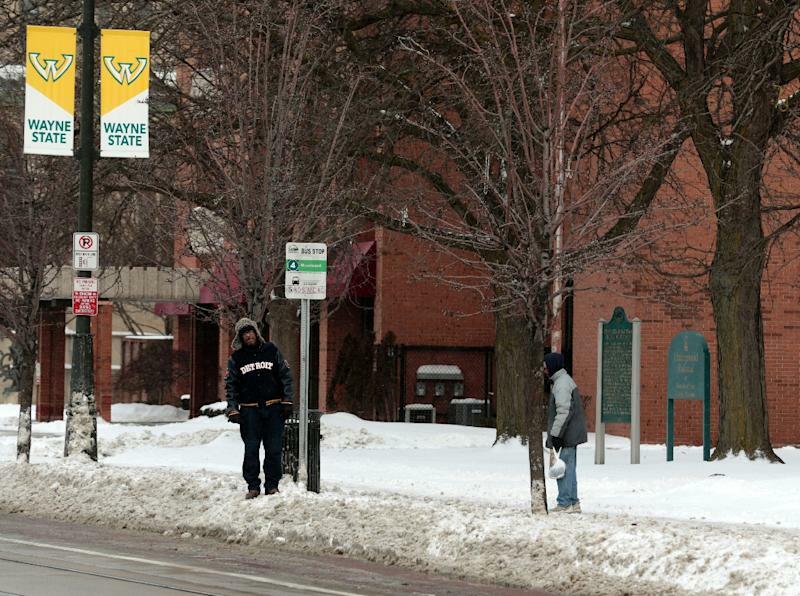 Officials in Milwaukee urged people in need of emergency shelters to call 211 so they could be connected with facilities with available beds. „This is not the night for anyone to stay outdoors,” Mayor Tom Barrett said. Barrett said all city services will be suspended Wednesday with the exception of police, fire and repair of water main breaks. The city’s priorities will be the safety of city workers and residents. Weather emergencies can certainly be tough on first responders who have no choice but to work. Police in Whiteland, Indiana, tongue firmly in cheek, took to social media to urge criminals to take it easy on them. “If everyone could refrain from committing crime these next few days that would be great k, thanks but srsly tho,” the department tweeted. Back in Chicago, the forecast is shocking a city whose residents take pride in not letting the weather slow them down. In the city’s Lakeview neighborhood, Angelo Mavraganes said he would close Stella’s Diner Wednesday due to weather for the first time since his father opened it in 1962. Still, Mavraganes said, he’s concerned about some of the regulars – single, elderly residents – who treat the diner as their second home. The staff has let most of the regulars they’ve seen over the last couple of days that they will close. He worries some will still show. The waitstaff has assembled a call list of some of the older regulars. They typically check up on if them if they go more than two days without a visit. Mavragenes hopes to reopen Thursday. He said one of the first things he and his staff plan to do when they get back to work is make a round of calls to make sure everyone is okay.